Pontiac stroker advice for 500hp...stroke size,cam,intake,heads? Re: Pontiac stroker advice for 500hp...stroke size,cam,intake,heads? Not to Knock anyone down I am posting a few Vids to show all what they are up against in the real world. Its How Fast they have become. The Very Best Pro Tour is not enough. All of the the Main Stream Combinations sold by all Pontiac Engine Builders Will Fail. There is No Such Thing as Safe Zone Street Racing as You Can See. You do not have to go there of course. But if you want to you must realize all the past combinations were sold to generate mainstream money income for the Builders. To Beat a Race Car On the Street you can only do it one way. Build a Race car & Put it on the street. License plate makes it street legal. Also need working headlights to see at night. This is the World I have know since I was 17 years old. Man they have gotten fast. As soon as you think safe zone you lost already. It Turned the Corvette world upside down. Was not even a Hellcat. I have a combination of my own that works in my 1970 Trans Am. Smoked 9 second drag cars on the street with my T/A. Most will not like it. It is 100 % Race Car. Solution for guys is BOOST. This last series of posts are extremely unsuited for this thread ! I can only speak for myself, of course. But, I could care less how fast the modern street racing cars are. Racing at 140mph on the street is a VERY dangerous, unintelligent, & in most cases an illegal thing to do. And you'll never have the quickest race car. Those are running over 300mph on the 1000' tracks. So, again, in my own opinion, I think that if you wanna post this kind of junk on this Pontiac forum you should start your own thread about it. Then those who care about it can read & post on that thread. One more time, I'll say that this is my own personal opinion, and may not reflect the opinion of others here. And, there is no personal offense meant by what I've said. Run on the streets late at night. Some of those guys are hitting 200 mph. This is the same basis of the 1964 Pontiac GTO. I cited what is really going on today. Wow! You guys have some "serious" machines there. And "all" Pontiac power. I love it. Stay on the Road Tracks. Not going to work on Streets Running Real Fast. My motor on a conservative dyno was about 530. Different calculators using weight and MPH at my track runs put it closer to 550-570 HP. I think getting over 500 hp it is going to take some ported heads for most folks. Now I just got a dyno sheet from a'69 Firebird NHRA stocker friend whose non ported and no acid treated heads on a 400 are close to 500 HP-but he's been racing that car for almost 40 years and has a BIG stocker cam in it. His previous RAIV 400 motor ran a 274 @ 0.050 cam! Those high HP cars usually boosted definitely are fast. Hard to beat boost making your own atmosphere. I've seen many at the Texas Mile and some at the last West Houston Street Car races at the tack in Sealy(owned by Hennessey who builds a lot of high end cars) and even on a prepped track Hellcats ZO6s have a hard time hooking up. Saw a ZO6 smack the wall even breaking them loose mid track. in the old days, we would mark out a !/4 mile, with another 1/4 mile shutdown on a deserted (in the middle of no-where) street, W/O any side streets or driveways entering it, run from a dead stop, to the end. It was fun, even if we were only doing 95-110 MPH. Most times, even cheater slicks didn't help that much. You had to know your cars ability to hook up, to give it that "just right" amount of clutch dumping RPMS, and how much throttle before mashing it, and powerhifting. Those cars had an honest 300-400 flywheel HP. And there were "lots" of up-sets, you wouldn't believe, not only because of driver error, state of tune, ect., but mostly...traction (or lack there of) is the great equalizer. Of course we're talking "drag racing". This new modern type of "rolling start" racing, on a public highway, doing well over 120 MPH, for 10 miles or more is purely juvenile and insane. And why are they "rolling starting"? Cause the tires won't put the power to the pavement outta the hole. Seems like a waste of money to me, but hey, what do I know. To each his own. Now if this same "street car" is to be raced on the weekends on a track, for competition reasons, different story all together. Have at it. I don't see a T/A as a drag car anyway, per se, (altho the suspension could be set up to), but more of a road car. I like Roger Bolingers T/A and think it is the epitome of T/A racing. Not sure how it would perform on the street tho. All purpose cars are Tough Tajoe. Biggest setback is all want nice street manners. Like you stated also Driver skills. They do run from a dead stop too these modern marvel muslecars. Pontiac was ahead of all. 1 st Production Turbo V8 ever. See where it progressed to now. 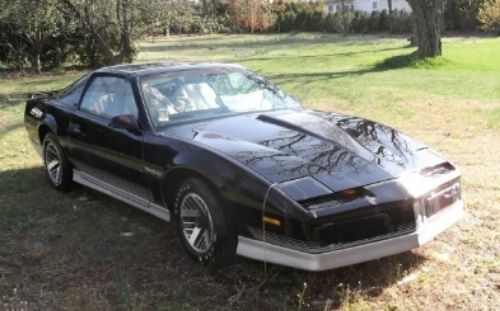 As much as I give Pontiac credit for their 301T, I don't know why they claimed it was the 1st turbocharged production V8. Buick had them beat almost 20 years before. LOL. Yeah. That'll supply some boost! Shout out to DMR performance and Ryan who is helping me with building the stroker we are discussing to get the TA where I want....if you guys need a hot rod guy who knows his stuff in orlando you couldn't find a better dude and has my car running great! And Dave at PTFB for setting up my suspension with almost all his parts... well will be all his parts when I'm done! We are the Last group that knows what a Pontiac V8 is. The Younger Gen only knows LS. If you want to boost a Pontiac Mark at Luhn Performance has some various bracket kits and a lot of good knowledge. You know what makes a car really fast? Its actually very affordable Turbocharged LS 5.3 76 mm single Turbo. Engine is literally Bone stock as long as its healthy and good shape. 700 + Hp on Pump gas. E85 Fuel about 875 Hp. Race gas Q16 1,000 + HP. Seen it done in the race shop I worked at last year. LS V8 & Mitsubishi EVO & 5.0 Fords. I was the old man in the shop. None of the younger guys knew what a Pontiac V8 was. Assumed Big Chief runs a LS V8 in his Crow GTO. Showed them pictures & said WTF is that ? Not an LS !. PONTIAC V8 Power Twin Turbo Cranking out 4,000 HP on 60 + psi Boost Pressure. LS engines are pretty amazing. For the HP you can get , I agree they are affordable, depending on definition of affordable of course. I definitely want to keep this angry bird all Pontiac power....now back to the stroker questions ha...and this may be an odd question....but one thing I wonder is what makes the different choices between the 461 they suggested the other size strokes? 468/472? Would do they suggest the 461? In general larger cubic inch engines produce more torque. They will not always produce more horsepower without better flowing heads and Much Hotter Cams used. Budget is another big factor. Big High flow heads are expensive. Many can not drive and get the power down clean with large engines. Fuel consumption goes up or MPG Drops. Can show later with Engine simulations posted by me. Many more 400s made than 455s. Prefer a 455 Block myself. Ideally you want to be able to drop the hammer down. Hook up immediate with Zero tire spin. Gone and car handles for intended purpose. Like a Teslas Roadster or Teslas P30 does. Hard to do with a Big Engine past 455. Easiest way Hotrodder point of view how well a combo works without Racing or Street Racing is how well does it do Burnouts ?